Joshua sends out two men to spy the land especially Jericho. The king of Jericho discovers this and know the men went to the house of Rahab, the prostitute. The king’s men go to Rahab’s house to arrest the men. Rahab protects the men, lying for them, and telling the soldiers the men left her house and to go and chase them. The soldiers leave. Rahab tells the spies that she has heard of God and what He has done for His people and that everyone in the land is afraid of the Israelites. She begs the men to show mercy to her and her family when the Israelites invade as she has shown mercy to them. The men agreed and Rahab lowered the men out of her house, using a rope, as her house was part of the city wall. The spies tell her to tie a scarlet cord in the window so all will know to spare that home. She must bring her family inside her home and not leave to be spared and not betray them to the king. Rahab agrees. The spies hide for three days, giving the soldiers plenty of time to search and not find them. The spies return to Joshua, reporting all that happened with Rahab and how the people are afraid of them. 6a) Joshua sent two men to spy out Jericho. b) Rahab heard about the Lord’s deeds: how the Lord dried up the water of the Red Sea so the Israelites could escape out of Egypt and about the destruction of Sihon and Og and their two kings. By her actions (saving the men), she herself was saved by God. That would increase her faith. 7) Personal Question. My answer: God is faithful. He will guide you and not lead you astray. I trust He puts me where He wants me with jobs and life. 8 ) Part Personal Question. My answer: He spared her and her family when the Israelites invaded, and allowed her and her family to live amongst the Israelites even though they were Gentiles. She was rewarded a unique place in Jewish history as becoming a direct ancestor of Jesus Christ and has been held up in the Bible as an example of faith. God has rewarded me with a rich life. I often feel undeserving and that I’m not doing enough for Him and His kingdom. I love this story. It shows how doing a good deed for others often blesses you ten fold. By saving the two men’s lives, Rahab saved her and gained a new home with the Israelites. Plus, she got to be a direct ancestor of Jesus. How cool is that! Great lesson about faith and doing the right thing. Watch VIDEO of Book of Joshua if you didn’t yesterday. Forty years before, as the Israelites poised to take the Promised Land, the 12 spies brought back entirely different news (Numbers 13:31-33): they didn’t believe the land could be taken. Fast forward 40 years and with hand-picked reconnaissance team, these two spies come back and confidently say, Yes! The Promised Land is ours for the taking! God honors true faith from anyone, regardless of race or religious background. Rahab, a prostitute (so someone very low on the totem pole) shows faith in God and is rewarded as Christ’s ancestor. Remember, the Israelites are literally standing on the banks of the Jordan River, awaiting Joshua’s command to re-take the Promised Land. He sends out spies to survey the land, not because Joshua lacks faith God will do what He says He will do, but because he’s taking action in faith by being prepared. We aren’t told who the two spies are, but Jewish tradition – speculation, really – says they were Caleb and the High Priest Eliezer. Joshua also shows wisdom by sending them secretly. The last spies that went out publicly turned out badly for Israel, when a majority of the spies came back with a discouraging report (Numbers 13). Why did the spies go to a prostitute’s house? It was the perfect place to hide out. In the culture of that day, there was a strong tradition of hospitality. If someone was a guest in your house, you had a strong duty to protect and care for them. However, Rahab went much further than the respect of cultural traditions regarding hospitality. She put her own life on the line for these men. The Bible simply reports Rahab’s lie; it does not praise it or excuse it. Rahab’s lie is not justified, but it does show courage. Remember, she is not being held to our standards as Christians. She was a pagan in a city where morality didn’t exist and had no clue really who God was. Thus, we cannot judge her. This surprising outburst of faith shows how God had a plan in bringing Rahab and the spies together. It is the same kind of thing we see when God supernaturally brings us to people who are believers or open to the gospel. Rahab’s declaration that “God is God in heaven above and on the earth below” was proof of her faith. It was not strong faith, but her faith good enough to save her and her family and be remembered by Biblical writers of the day (Hebrews 11:31 and James 2:25). 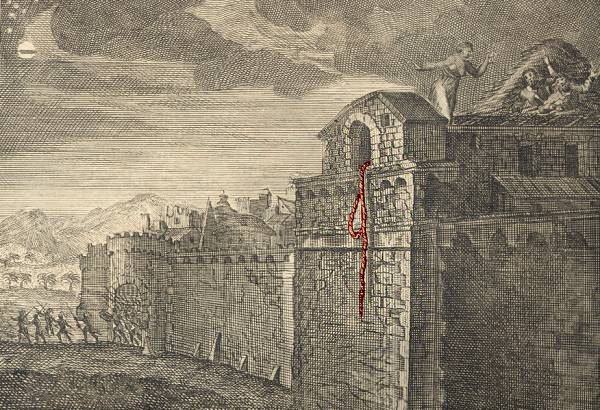 Note the color of the cord that ultimately saves Rahab: scarlet. As early as the first century, commentators such as Clement of Rome, Justin Martyr, Ireneaus, and Origen saw this scarlet cord as a symbol of the blood of Jesus. What was the outcome of the spies’ mission to Jericho? It failed as a reconnaissance mission. The spies brought back no news of how heavily fortified the city was or how to penetrate it. Instead, all they brought back was news it could be defeated. The purpose of the mission was to encourage and fortify the people that Jericho could be taken–and that was exactly what the spies did. The second outcome of the spies’ mission to Jericho was the salvation of Rahab and her family. God will go to great lengths to save people–to bring them to Him. Here, He saved an ancestor of Jesus. God will save those in your life as well if you have faith and pray for them. No one is truly lost and nothing is impossible with God.